It’s time to think about holiday shopping! 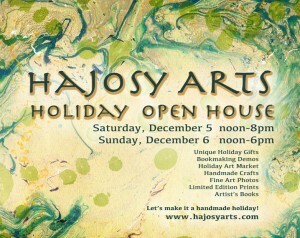 Hajosy Arts’ Holiday Open Studio provides an opportunity to support a local artist and make this a handmade holiday. Unique gift ideas, holiday cheer, and an intimate look into the print portfolios and artist’s book library of Cristina Hajosy. DJ Chris’ eclectic holiday music mix should not be missed! Saturday, December 8, 2018 from 2-11pm. Come join Cristina at her Holiday Open House! Saturday, December 5 from noon to 8pm and Sunday, December 6 from noon to 6pm. 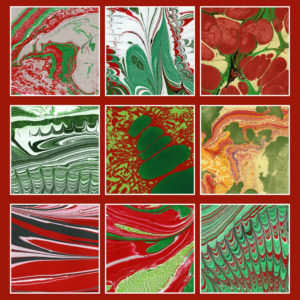 Visit Hajosy Arts for unique holiday gifts, artist’s books, fine art prints and photography, and an intimate look at the art education and creativity that she shares. 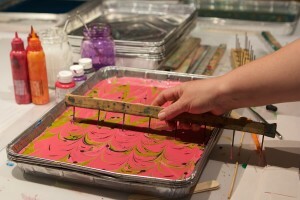 Gift certificates for private instruction, art playdates, and group classes available! Open House discounts on upcoming art workshops for the Winter term. Learn more about what Cristina teaches, the techniques and projects that are covered, and how to harness more creativity in your art practice and life. The Brookline Arts Center is pleased to once again host its annual Artist Marketplace December 5-7 and 13-14, 2014. Join Cristina Hajosy and her fellow faculty members and local artists at the special Preview party on Friday evening. Having early access to all the goodies will guarantee success in finding the perfect holiday gift. Chat with the artists, enjoy some refreshments, share some holiday cheer, and of course, buy handmade!